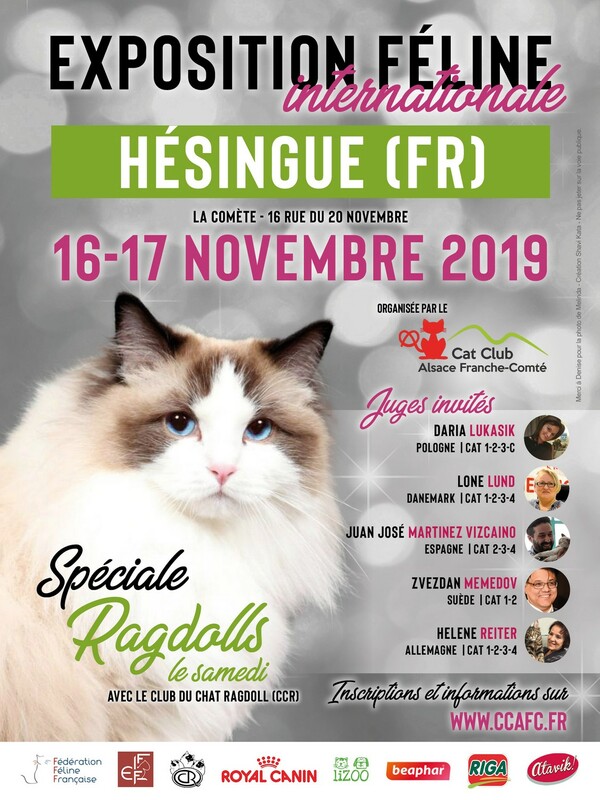 Welcome on the website of the Cat Club Alsace Franche-Comté, association founded in 2016 gathering together enthusiasts of cats purebred or not. Going through the various sections of the website you will find all documents likely to be useful (list of breeders members, forms, information about the club, about our next show, etc ...). Have a pleasant visit ! 31.03.2019 : The next show will be in Hésingue. 09.11.2018 : Results and pictures of the show in Raedersheim are online. 23.04.2018 : Results and pictures of the show in Herbsheim are online. 10.12.2017 : We are very happy to announce that after the probatory year, the Cat Club Alsace Franche-Comté has been validated as member of FFF yesterday during the FFF General Assembly. Thank you to everyone involved in the success of our club and ours shows. Let's the adventure continue ! 26.11.2017 : Results of the show in Meyenheim are online. Copyright © 2016 CCAFC. All rights reserved.